As we say goodbye to winter, I decided to kick it out with one final classic winter dish, Cassoulet. Cassoulet originates from the Provence region of France and at it’s most basic is nothing more than a rich, hearty bean and meat stew. It’s very flavorful, great with wine, ridiculously easy to make, although it does take some planning. I break it down in this photo essay recipe. You need to plan in advance a bit when making Cassoulet because you need to start with dry beans and soak them overnight (12 hours) in cold water. Canned beans are a no no – as they will turn into a disgusting mess resembling re-fried beans after the long stewing process. You also need to factor in time to cook the beans. More on that below. Sweat the duck legs in a skillet to render some of their fat. After about 10 minutes, remove the legs to a heavy bottomed pot. Into the skillet, add the lamb and brown well to form a slight crust on the meat. You may need a dollop or two of olive oil depending on how much duck fat was rendered. Once the lamb is browned, remove that to the heavy pan and cover the duck legs with it. 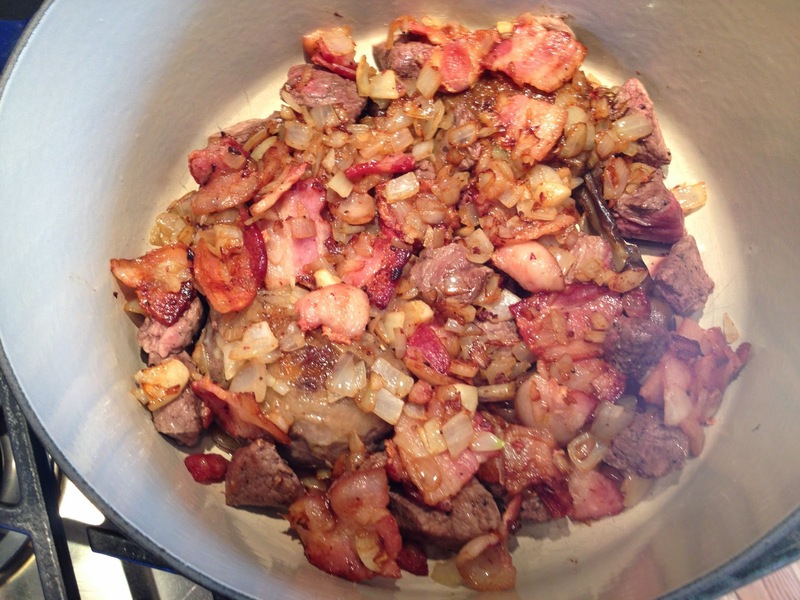 In the skillet, add the garlic, onions and bacon and cook until the onions are softened and the bacon has browned, about 10 minutes. Stir frequently. Once these items are cooked, remove them to the heavy pot and cover the duck legs and lamb. You are literally building layers of meat here! 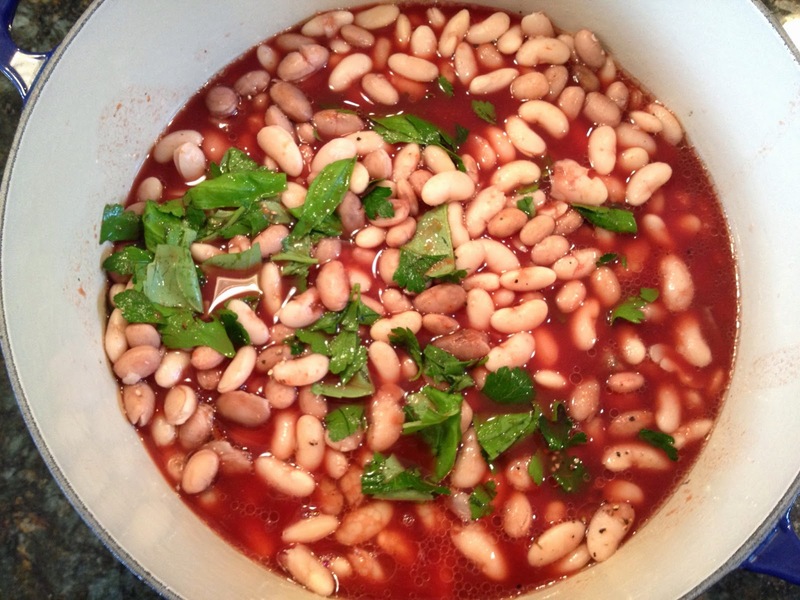 At this point, put your cooked beans (see this link if you’ve never cooked beans) on top of the meats in the heavy pot and spread them in a layer evenly. In a large bowl, combine all your liquids. 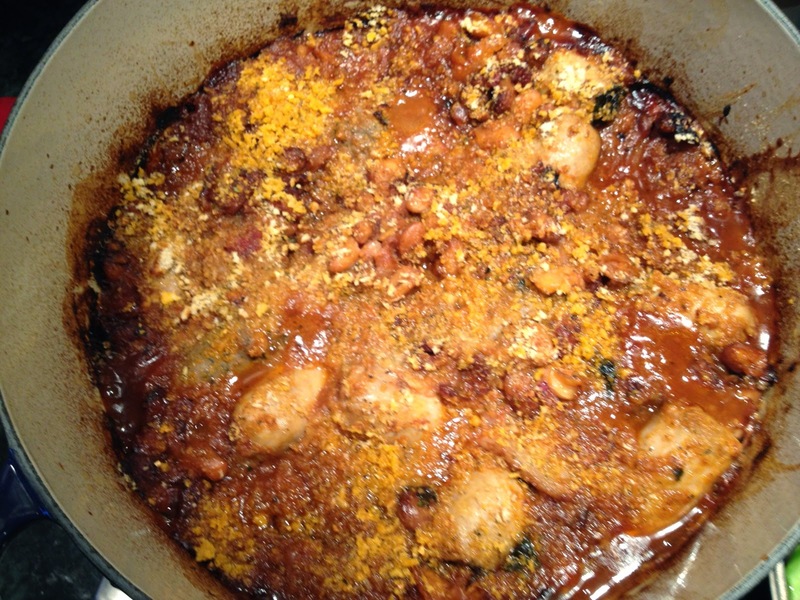 Cassoulet typically uses Herbs de Provence, but since all I had was basil and parsley, that’s what I used. Add the herbs to the liquids, whisk to combine and pour over everything in the heavy pot. Bake the pot in the oven covered at 325 degrees for about 3 hours. If using a convection feature, you will need no more than 2 1/2 hours. In the skillet, brown the sausages and reserve on a plate. When you are down to 30 minutes left in the cooking time, add the sausages to the pot. Press them down into the mixture and return to the oven uncovered. Finally, with about 10 minutes left to go, spread a layer of bread crumbs on top of the mixture. Once they’ve browned, sprinkle with chopped fresh parsley and bring the pot to the table and serve. Hearty, a little greasy, but fabulous! Excellent, John, you are speaking my language here. 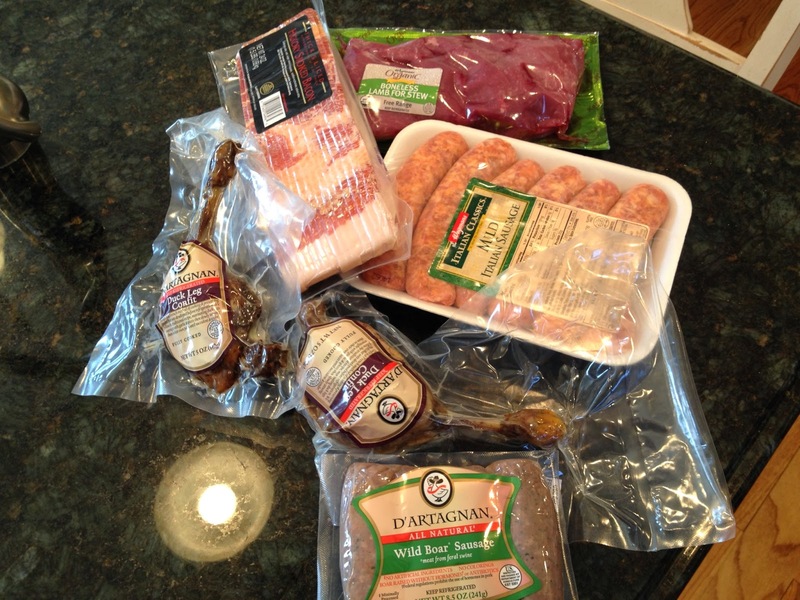 Cassoulet is in the plans for this weekend. I use Alain Ducasse recipe with some very slight modifications. Cheers! 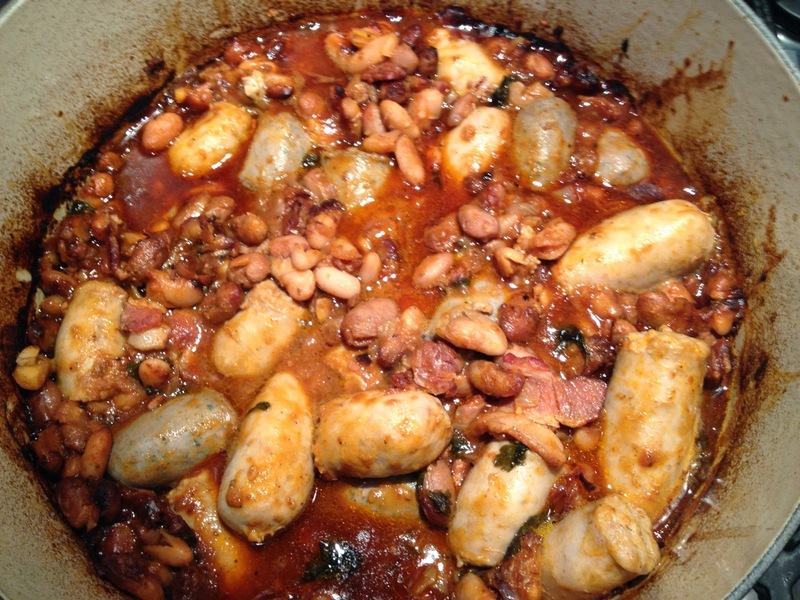 You know, I find Cassoulet to be like any other classic Italian recipe. There are more versions than there are Grandmothers. To me, it’s got to have some form of duck, sausage and beans. After that, it’s wide open. I’m making it this weekend as we’re getting snow here and the temperatures are set to plummet. Good to hear from you Anatoli. Salute!